CoBank reports that the US needs 1 to 5 million more acres of organic row crop production to meet consumer demand. What is the hold up? Our new study will uncover the answers. Is it time to pursue this market and help your farmer customers reap the benefits? With information from this study, you will know if the opportunity is there for your company, and you will learn the best steps to start serving this market with huge potential. 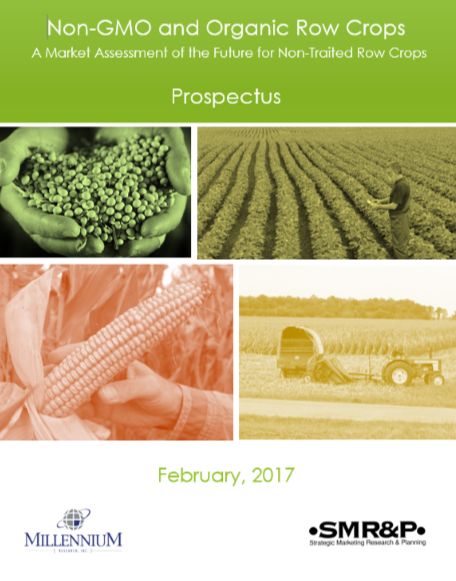 This report will provide an economic overview of the current and near-future state of non-GMO and organic production of corn and soybean field crops. Data will be gathered from the industry, including suppliers, producers, and processing companies, to predict future trends and identify barriers that prohibit the growth of organic and non-GMO production, particularly in the Midwest. The report will also identify potential solutions to addressing each of these barriers, and project how organic and non-GMO production could grow as these barriers are overcome. Compared with other studies of these markets, this report has the advantage of primary research among actual organic and non-GMO farmers, as well as traditional commercial farmers. It will include historical and governmental data for reference, while the primary findings and forecasts are based on original primary research among producers, the supply chain, and industry experts. Act now to reserve your copy.